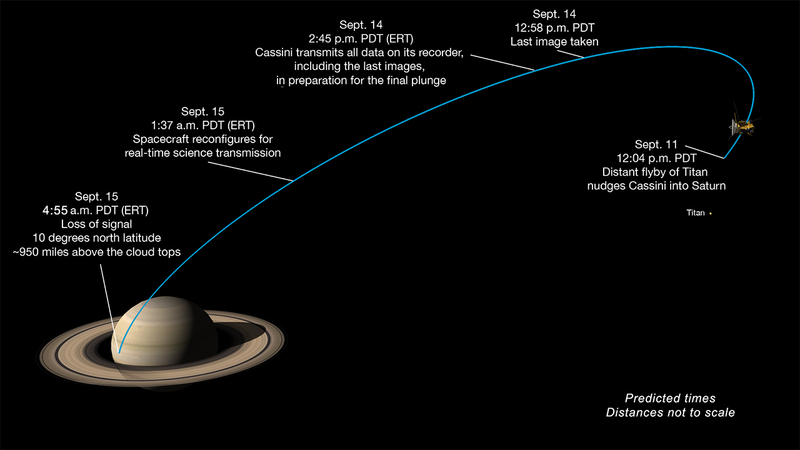 In a graphic describing Cassini's final approach to Saturn NASA lists the timestamps as 4:55 am PDT (ERT). What does this mean? I am assuming that PDT mean pacific time, but I can't find out what ERT means. Also when talking about time, is it the time when something actually happens, or, is it when the light actually gets to us? ERT is Earth Received Time. I.e., when we find out about the event. As answered before, ERT is when something is retrieved/received at Earth, which may be a while after its occurrence when talking about interplanetary/beyond communication (low Earth orbital data transfers are pretty fast). PDT is Pacific Daylight Time, which is UTC-7. PST is UTC-8, which is used at different times of the year because of daylight savings (despite my opinion of it being redundant for most people in today's world). For the second question, time is confusing. But for the most part, we use when light (or other energy) is available to our senses, or often more preferably, our data collectors. Not only is it annoying to subtract the small amount of time (relative to Earthly sources) from when light reaches the eyes, but when talking about spacebound objects, such as stars, we don't have any means of knowing what is occurring at the spot, as a star can die and we can still see its light from the past traveling to us, due to our location being many lightyears away. PDT is Pacific Daylight Time. PST is Pacific Standard Time. A lot of the communication with space probes is done at JPL (Jet Propulsion Labratory), which is in California, so that's probably why that time zone was chosen. Presumably the probe itself doesn't have much use for Daylight Savings Time. Not the answer you're looking for? Browse other questions tagged deep-space time or ask your own question. What type of data did New Horizons send to Earth in order to diagnose the switch to Safe Mode issue? Where can the term “Sol” used? How did NASA refer to dates and times of a mission in the 1970s? What is the date for a Mars file?